This week. we�ve added several lovely new patterns for you to enjoy! 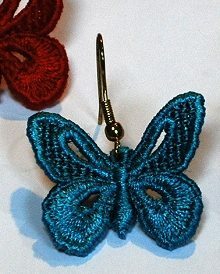 Our popular series of embroidery jewelry has been updated with the FSL Butterfly Earrings Set. Embroidery jewelry is very distinctive and eye-catching, and is easy to decorate with beads and hotfix crystals. They are great to give away as gifts. 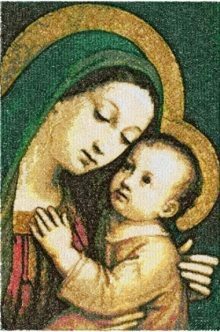 Fans of Fine Art will be pleased to know we�ve added Our Lady of Good Counsel by Pasquale Sarullo, the Italian painter. This design is fantastic to use for a table runner or wall hanging. It�s also just the right size to make a lovely quilted cover for a Bible or photo album. We explain how to do this in some of our projects, so you might want to check them out. 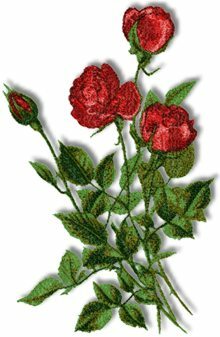 Finally, we have added the Beauty of Norwich Rose to our collection of Flower patterns. This is a beautiful, realistic design in the photo-stitch technique. It is great for framing, or you can use it to embellish a variety of projects. It looks lovely on placemats, table linen, cushions, totes and similar items. 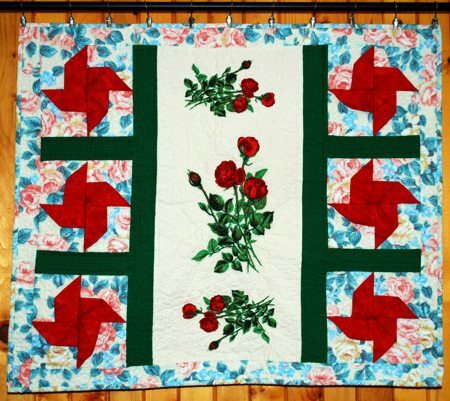 We used it in our new project, the Quilted Rose Wall Hanging with 3D Windmills. This bright quilted wall hanging is the perfect summer-themed centerpiece for your living room or dining room. The red whirligigs along the outer edges of the quilt are actually three-dimensional, adding an eye-catching element to the quilt.